Being adventurous is very different from actually experiencing it. The real adventure in one’s life is survival. To make your adventurous streak more daring and real, Bandhavgarh365 has for you the Jungle Survival Training Course which spans for a period of 3 days and makes you aware and train you through obstacles for a life in wilderness. For jungle survival training one needs fire, water, shelter and food as the basic necessities. And to make sure how to have them, store them and use them is the art and technique taught here at jungle survival courses. This jungle survival school in India teaches you how to mark a secure location for setting up a shelter keeping in mind the insulation from wind, rain and ground. At this jungle survival course you are taught and trained to make a machan for setting up a shelter, to living in tents. For survival in the jungle, the art of igniting a fire for various purposes like cooking, to alert a signal or for safety and protection is what the main aim is. This jungle survival camp teaches you to work as a team to collect material for making it easy to light a fire. All kinds of up-to-date devices like metal strikers, pyrite, flint eye glasses, magnifying lens etc are used here. 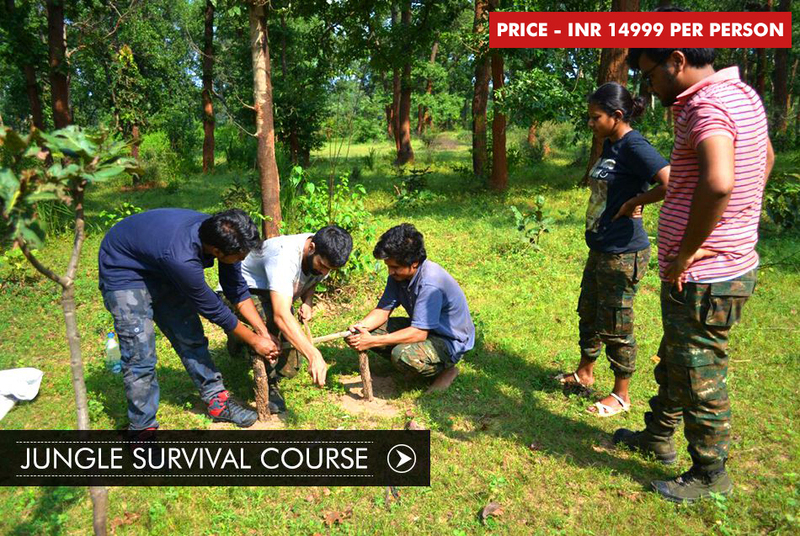 Bandhavgarh365 jungle survival training course India leaves no corner untouched when it comes to training of survival. Water is needed by every living being for its survival. You will be taught how to find a water source, how to store and how to do it’s rationing for surviving in the jungle for a longer time. Amongst other ways of getting water is through transpiration, by collecting dew or through harvesting trees like cacti. Water must be fit to drink and for that various purification methods will be taught here at Bandhavgarh365 jungle survival course in India. To satisfy the hunger pangs in the jungle can only be met if you know how to hunt, do fishing and have knowledge of plants growing in the wild knowing what poison free is and fit to consume. For the same, we will teach you how to trap animals, insects or rodents, how to create a fishing rod and how to use it at the perfect location. Gutting and cleaning of the various parts fit to eat is another important lesson taught here. You work as a team here to collect things and then cook them on your own, by using the fire lighting methods taught to you. Jungle survival training in India by Bandhavgarh365 aims to make you so independent and full of knowledge of all kinds of techniques needed to be used in the jungle for survival from tying different knots, building a raft or a fire torch, to teaching you navigation, cartography, reading maps and using a compass. The basic of good hygiene is also taught here by teaching you how to set up a clean toilet area.